When visiting Aguascalientes, enjoy the excellent location, comfort and safety that the One Aguascalientes Sur has to offer. The hotel is located in one of the main industrial development areas and is also ten minutes from the airport and ten minutes from the Villa Asuncion shopping center, where you can spend your free time exploring restaurants, movie theaters, and high-end boutiques. The hotel features a simple, modern and completely new design and is located right off José María Chávez Avenue. It's perfect for business travelers and vacationers, offering just what you need to rest and recharge. In addition to the Nissan Aguascalientes Plant, which is very close to the hotel, the city center is ten minutes away. Avenida Las Americas, home of some of the best restaurants and attractions in the city, is five minutes away. Visitors must see the City Theater, the San Marcos garden, and the Plaza de Toros Monumental Bull Arena, all very close to One Aguascalientes Sur. This comfy work area offers private work stations for guests that need to stay productive during their visit. Each desk has a computer with complimentary high-speed Internet access, so you can easily take care of your business. 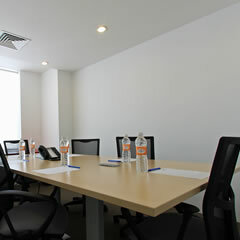 There's also a private meeting room located in the hotel lobby. We know that your time is valuable. That's why we do all we can to help you achieve the objectives of your trip. Overall, my stay was very pleasant. Excellent service from staff. Breakfast service has improved from my last stay. Rooms are clean. This is an excellent choice for a business trip. Highly recommended hotel. Although there was a line at check in, the solo clerk did a great job being as expedient as possible. Once it was my turn the process was fast and easy. The room was small but it was the perfect size for the price and its purpose as I only needed a one night stay after flying into Aguascalientes. "Nice and reason priced hotel"
Hotel One is a chain hotel throughout Mexico and mainly used by business travelers as well as travelers passing by the city. The rooms are clean and comfortable, but for a family of 3, the room is a little small, but you could manage for a one night stay. Their breakfast is excellent with american style breakfast with scrambled eggs, ham and sausage, frijoles, yogurt, juice , coffee , cereals, etc. The breakfast is free. The price for one night stay is around 900 pesos. Good parking space and the staffs are very helpful and courteous to guests. Can¨t beat the free breakfast and coffee or tea during the day. This hotel is nice, confortable, there only 2 issues, the light of the hallways can get in thru the doors and is annoying plus there was a bad smell on our room we couldn't figure out where it came from. Otherwise, it is a good hotel. "Muy bien por lo que pagas"
Estan limpias las habitaciones, buenas camas, la ubicación es buena si vas a la Universidad Panamericana o en la nissan, hay lugares cerca para cenar o comer, lo recomiendo ampliamente, a pesar de que son cuartos chicos. This room has been specially equipped to provide comfort to our special guests. These rooms have the same amenities as standard rooms but are wheel-chair accessible and provide safety rails for the shower, toilet and tub. They also have cable TV, Internet, a desk and a queen size bed. The cozy atmosphere of this room ensures a deep rest. It has one Queen size bed and one Twin size bed, a desk, a closet, air conditioning and heating system, wireless Internet, telephones with voice mail and cable TV. A modern room that provides exactly what you need, making it a perfect base for your endeavors. It has one queen size bed, desk, independent air-conditioning unit, wireless Internet, phone with voicemail and cable TV. The cozy atmosphere of this room ensures a deep rest. It has two double beds, a desk, a closet, air conditioning and heating system, wireless Internet, telephones with voice mail and cable TV.